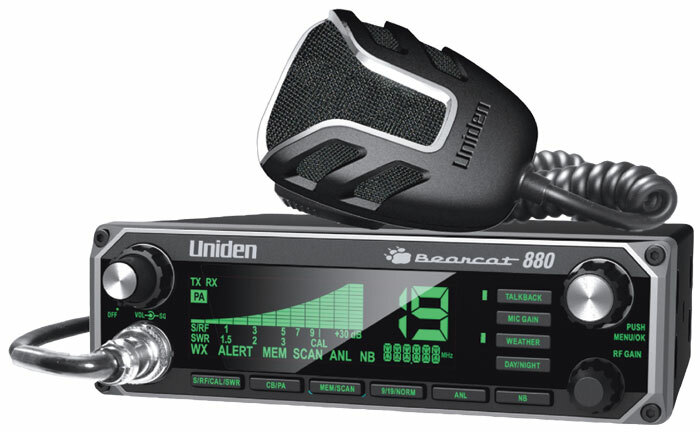 Drive with confidence - stay connected with a Uniden Bearcat 880 CB radio on the open road! Powerful and ruggedly designed the BC880 sports advanced features and settings to suit any CB user. The Uniden BC880 is a perfect blend of functionality and style. The BC880 comes with a wide array of features to keep you in touch and informed. This Bearcat CB radio features a sleek face with 7-color LCD display that will match the interiors of modern and older vehicles alike. The advanced features of the Bearcat 880 include a large, easy to read display, weather frequencies, built in SWR, channel scan, and much more. Uniden's six-pin noise canceling microphone will keep the audio crisp and clear with less static. Add a wireless microphone for even more functionality with the Bearcat 880. NOAA Weather alerts round out the communication capabilities of the Bearcat 880, helping you to stay informed and prepared for anything!